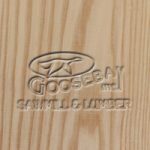 Ash, White - Goosebay Sawmill and Lumber, Inc.
White ash is the hardest among the different ash species with an average hardness rating of 1320. The sapwood is very light in color, sometimes nearly white, the heartwood is brown. It has a coarse grain and resembles oak in appearance. It is heavy, strong, hard, and stiff. White ash grows in the Eastern half of the United States. Its primary uses are as decorative veneer, tool handles, oars, baseball bats, cabinets, furniture, and flooring. When we are able to obtain suitable ash logs, we saw 16-18 foot strips for use as gunwhale stock.